So that's it for now. Thanks for joining us as we looked at the reaction to last night's Premier League games - and looked ahead to tonight's six matches. We'll be back later to bring you live text commentary on those. And it could be an eventful night with all of the top seven in action. Southampton's teenage striker Michael Obafemi has been ruled out following the reoccurrence of a hamstring injury. Danny Ings is also nursing a hamstring problem and is again set to miss out, while Mario Lemina remains sidelined. Fulham manager Claudio Ranieri has revealed he has a fully fit squad, with central defender Alfie Mawson returning from a knee injury sustained in December. Lazar Markovic is pushing for his first start for the club after coming off the bench in last Friday's 3-1 defeat at West Ham. Sulaimon Adelekan: Newcastle will stay up this season but things must change for the next season. For me, Cardiff City and Huddersfield are relegated. Everton fan. Let's put last night's result in perspective. 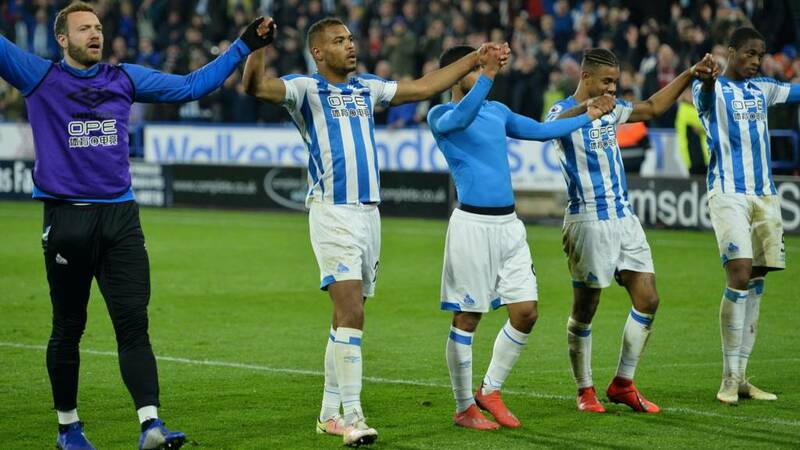 Cardiff, Huddersfield and Lincoln are the only games we have won since December. 2 of those teams are going down. It's the derby Sunday, say no more. Two massive wins against Huddersfield and Burnley. Not safe yet, but two more wins and I think we will be. Mamadou Sakho will miss the game because of the knee injury that forced him off during Palace's win at Leicester while fellow defenders Martin Kelly and Aaron Wan-Bissaka will be assessed. Manchester United caretaker manager Ole Gunnar Solskjaer could be without as many as nine first-team players. Ander Herrera, Anthony Martial, Jesse Lingard, Juan Mata, Phil Jones and Nemanja Matic are all ruled out, while Marcus Rashford (ankle) is a doubt. Matteo Darmian and Antonio Valencia remain absent, but defender Marcos Rojo is expected to be involved. Alex Iwobi (ankle) and Stephan Lichtsteiner (back) will be assessed before Arsenal aim to tighten their grip on a top-four spot. Ainsley Maitland-Niles (illness) is available and Laurent Koscielny could start after overcoming a minor injury to play as a substitute in Sunday's win against Southampton. Bournemouth midfielder Jefferson Lerma begins a two-match suspension for accumulating 10 bookings. Steve Cook, Callum Wilson, David Brooks and Junior Stanislas remain sidelined while Lewis Cook and Simon Francis are long-term absentees. 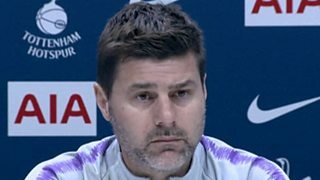 Rob: Total class by Pochettino to apologise to Mike Dean for venting his frustration on Saturday and no complaints about what Dean said to him. Paul Skinback: I'm amazed at the humility Pochettino has shown. Mike Dean clearly said something that got to the whole management team and they're letting him get away with looking the victim. It's time the referees became accountable for their actions and failures. Tottenham manager Mauricio Pochettino yesterday issued a public apology to referee Mike Dean after angrily confronting the official at the end of Saturday's 2-1 defeat at Burnley. The 46-year-old Argentine was charged with improper conduct by the Football Association over the matter and has accepted the charge. "It is not the way to behave," Pochettino said. "Watching my behaviour afterwards on video, I need to accept the charge from the FA. I need to apologise to Mike Dean, I cannot behave in that way." The battle for a Champions League place hots up with Chelsea hosting local rivals Tottenham. Blues boss Maurizio Sarri says he has not decided if he will pick goalkeeper Kepa Arrizabalaga after he refused to be substituted in Sunday's League Cup final. Forward Callum Hudson-Odoi and midfielder Ruben Loftus-Cheek could be handed starts. Tottenham manager Mauricio Pochettino is again without Eric Dier (tonsillitis) and fellow midfielder Dele Alli (hamstring) is not yet ready to return. Liverpool's draw on Sunday put Liverpool a point clear of Manchester City, who are without Fernandinho and Aymeric Laporte after both suffered muscle injuries in the Blues' Carabao Cup final win. John Stones and Gabriel Jesus remain sidelined, while Benjamin Mendy is nearing fitness and will be assessed. West Ham manager Manuel Pellegrini has reported no new injury concerns, with Manuel Lanzini having made his comeback from a long-term knee problem in Friday's win against Fulham. Defenders Fabian Balbuena and Winston Reid have returned to light training but are not yet fully fit. Liverpool are looking to bounce back from successive 0-0 draws against Bayern Munich and Manchester United. Roberto Firmino has a chance of playing despite being forced off at United with an ankle problem. Should the Reds decide against risking the Brazilian forward, he would be likely to return in Sunday's Merseyside derby with Everton. Naby Keita will be monitored after a recent illness, but defenders Dejan Lovren and Joe Gomez remain out. Watford could name the same side which began Friday's 5-1 win against Cardiff. This match comes too soon for full-back Kiko Femenia, who is back in training after a hamstring injury, but he is expected to be their only absentee. Now then, with the top seven all in action tonight, let's take a lot at the top of the Premier League table. Sulaimon Adelekan: Sean Longstaff has been incredible in the past few months, an England call up is inevitable. Newcastle will stay up this season but things must change for next season. Andrew Neill: England have tended to pick 4 or 5 central midfielders for their squads. With another one to be announced in the coming weeks can anyone really name 5 central midfielders playing better than Sean Longstaff at present? Waseem Akhtar: Manchester United players will have to stand up and be counted for tonight! I wonder if the youth will have there say? I'm going 2-0 to United. Ole Gunnar Solskjaer said yesterday that the increased workload he is demanding of Manchester United's players is partly responsible for their recent spate of injuries. United could be without nine senior players for tonight's game at Palace. It got lost amid all the injuries and the impact of the result on Liverpool's Premier League title challenge but the goalless draw at Old Trafford on Sunday was enough to nudge Manchester United out of the top four again. Given they were 11 points adrift when Ole Gunnar Solskjaer took over, that in itself is no reason for alarm but the Norwegian is not expecting that coveted Champions League place to be decided until the final weeks of the season. “It is going to be exciting," he said. "We’ve got Chelsea at home to play yet, and also Arsenal away. Tottenham are playing at Chelsea this week as well. "In the end there will be so many games that matter because I don’t think there’ll be many points in it between four, five and six." Borussia Dortmund feature in today's gossip column, with Barcelona goalkeeper Marc-Andre ter Stegen saying Germany team-mate Marco Reus would have been a great signing had the midfielder had not wished to stay in Dortmund. The top story is about David de Gea being in danger of being priced out of Manchester United, despite their willingness to offer their goalkeeper a new £350,000-a-week deal. Staying with Manchester City, and the Football Association is investigating claims the club made a banned payment of £200,000 to Jadon Sancho's agent when the England winger was 14 years old. The allegations were made in documents published by Der Spiegel. Sancho then moved to German club Borussia Dortmund in the summer of 2017. Manuel Pellegrini returns to Etihad Stadium tonight for the first time since he was replaced as Manchester City boss by Pep Guardiola. Guardiola's appointment was confirmed in February 2016, when City were still in the hunt for all four trophies, as they are now. However, straight after the announcement, City collected just four points from their next six league games and were knocked out of the FA Cup by Chelsea. Pellegrini did not think the upheaval helped his team. Guardiola said: "I think everybody was honest and the intention was not to create a problem for Manuel when he was here. "But if it was the reason - and I think nobody can know it - I'm sorry and I apologise."